With fog hovering in the distance, the crystal clear and calm water of Lake Superior reveals the rocky shoreline of Sinclair Cove in Lake Superior Provincial Park of Ontario, Canada. The protected shores and waters of Sinclair Cove in the pristine Lake Superior Provincial Park of Canada, are a hidden gem. As the fog rolled in and out of Sinclair Cove on this cool summer morning, the scene before us continued to change with it. The clear and still water was like glass revealing the colourful rocks laying just beneath the surface along the shoreline of Lake Superior. It's shores are fringed by Boreal Forest which have somehow taken root on the smooth rounded hills - remnants of ancient mountain ranges. 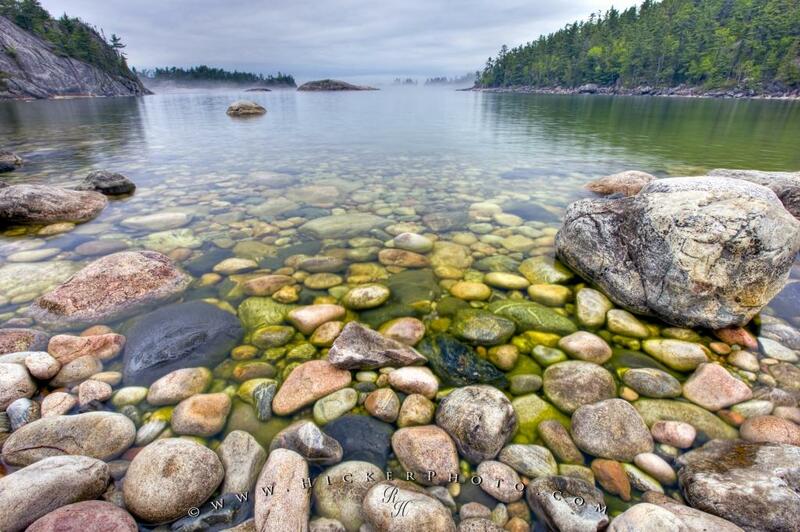 Photo of the rocky shoreline of Sinclair Cove and the water of Lake Superior, Ontario, Canada. Sinclair Cove, Lake Superior, Lake Superior Provincial Park, Ontario, Canada. I photographed this photo with the digital SLR camera model Canon EOS-1Ds Mark III, aperture of f/23.0, exposure time of sec. on ISO 100, as always I used a original Canon Lens, the focus lenght for this picture was 16mm.